This post is sponsored by Filippo Berio. As always, I only work with brands I love and use in my own kitchen, and all opinions are my own. Let me drop some wisdom on you today: foods on sticks are better. I don’t care if it’s a County Fair Corn Dog or a Foie Gras Lollipop: food on a stick is better than food that is not on a stick. 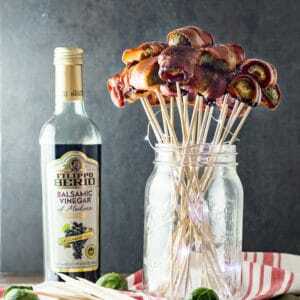 So let’s make some delicious bacon wrapped Brussels sprouts that will be a show-stopping appetizer at your next party. Let make some food on a stick! Look, I know that Brussels Sprouts get a bad reputation, but it really is so undeserved. I really think people just don’t know how to cook them. 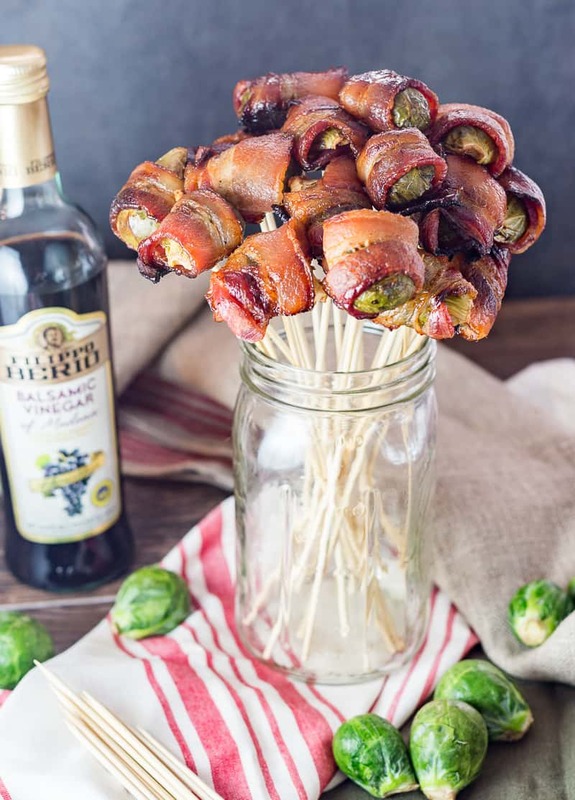 Pro-tip: if you aren’t sure how to make something, try wrapping it in bacon. Even Brussels Sprouts doubters will be tempted by this dish, I promise. 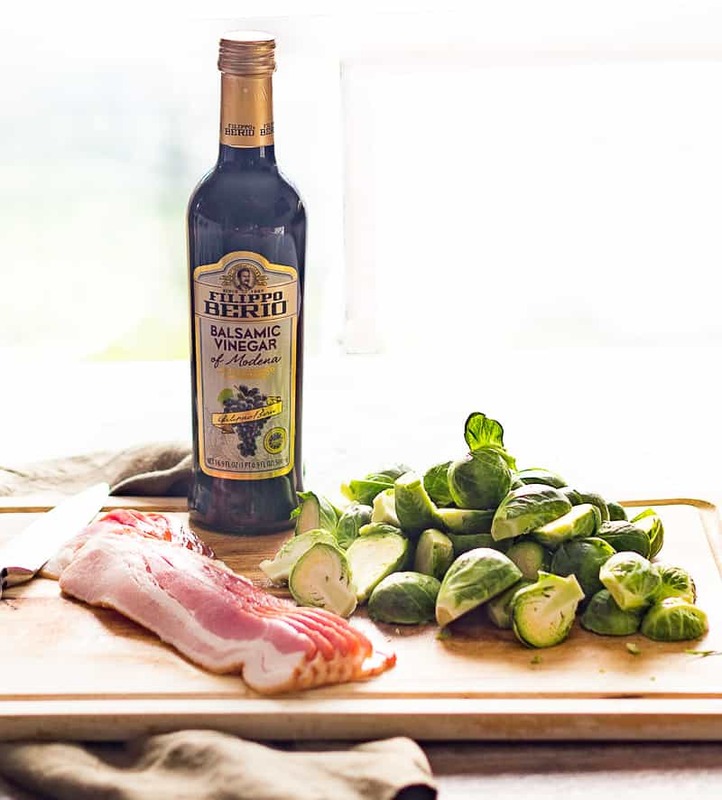 The cabbage-y flavor is cut with the beautiful acidity and body of Filippo Berio Balsamic Vinegar mixed with just enough honey to almost caramelize the bacon and sprouts as they roast. If you are intimidated by the actual construction of this dish, or even just wondering how to wrap brussels sprouts in bacon, it is SUPER easy. 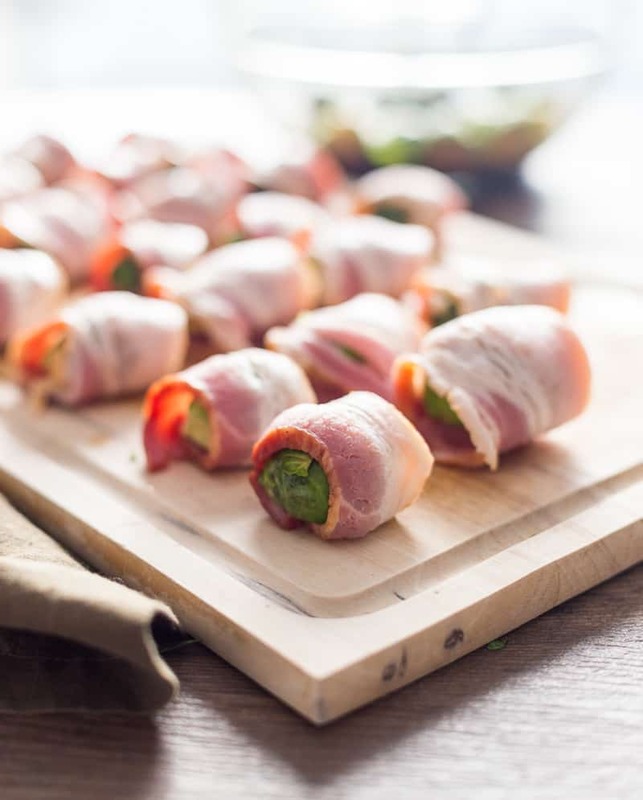 Bacon tends to be a stretchy meat and has lots of give – just pull it the entire way around a cut half of a sprout, and then place the sprout cut side down on the baking sheet, making sure the tail end of the bacon strip is tucked under and being held down by the weight of the sprout. The first time I made these I thought for sure that wasn’t going to work out. I was certain I would open the oven to a pan of roasted Brussels sprouts with a bunch of bacon pieces around it that had shrunk off in the cooking process, but the weight of the sprout really does keep it all together. 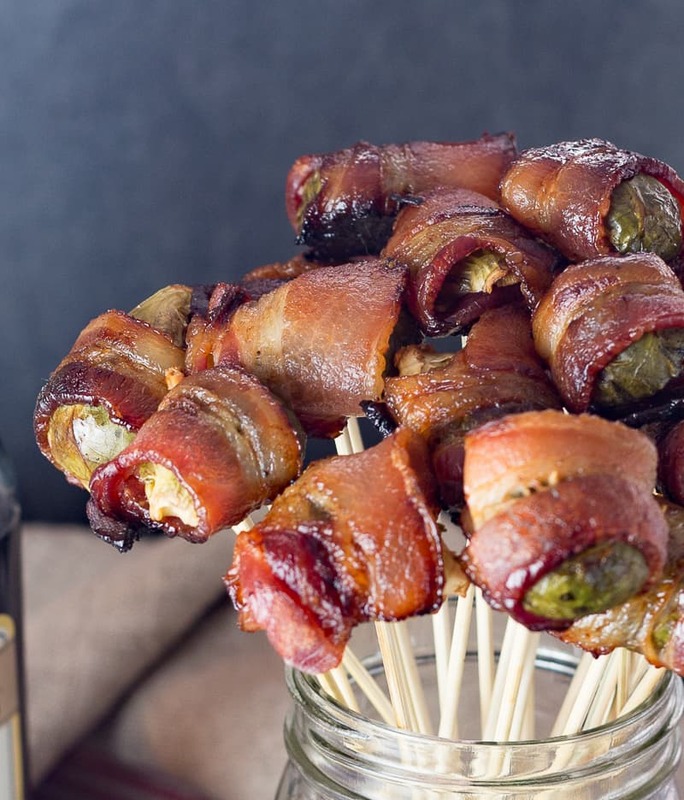 Once the bacon wrapped Brussels Sprouts are finished cooking and have cooled for about 10 minutes, flip them over and stab each one with a skewer right down the middle. 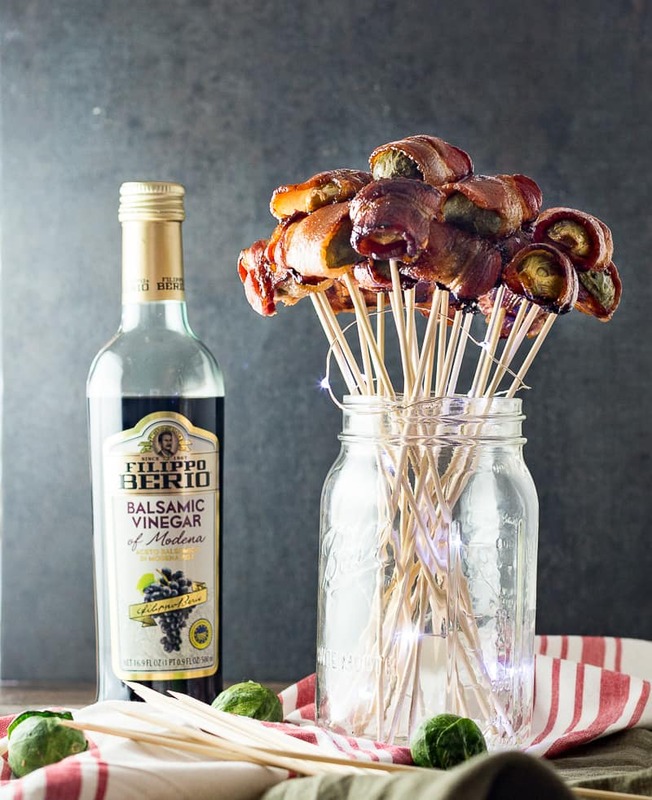 Once all the sprouts have been skewered, place them in a vase or a mason jar and serve them like a bacon-y vegetable-y bouquet. They are really good dunked in a little more Filippo Berio Balsamic Vinegar right before eating, but as someone who values their table linens, I don’t recommend leaving any out for your guests to dip in or you’ll end up with a mess. 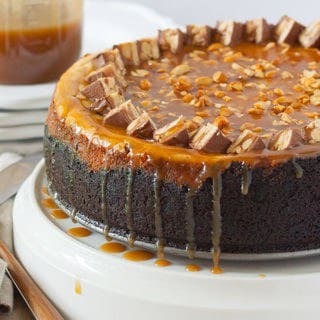 What are some of your favorite ways to serve party foods? Are you as pro food-on-a-stick as I am? 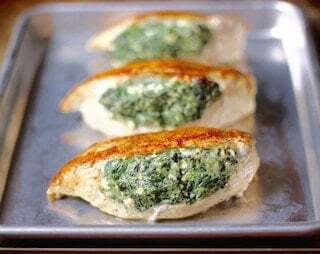 Preheat the oven to 400 degrees F. Prepare a sheet pan with a piece of parchment paper. In a large bowl, beat the honey, pepper, and Filippo Berio balsamic vinegar until combined. Trim each brussels sprout, removing any loose or ugly leaves and taking a thin slice off the bottom of it to remove any toughness to the bite after cooking. Slice each sprout in half, placing it into the honey/vinegar bowl as you go. Once all of the brussels sprouts halves are in the bowl, toss to combine. 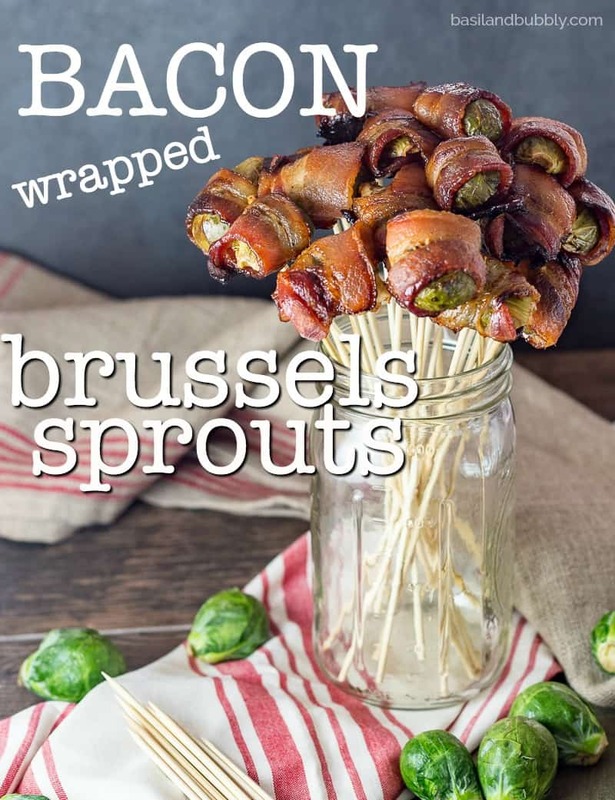 While the brussels sprouts are sitting in the honey and vinegar post-toss, cut each strip of bacon in half "short-ways", which is to say you should have two shorter strips of bacon after the cut, and not two thinner strips that are the same length. Wrap each brussels sprout half with bacon with the "seam" of the bacon facing the cut half, and place it seam / cut side down on the pan. 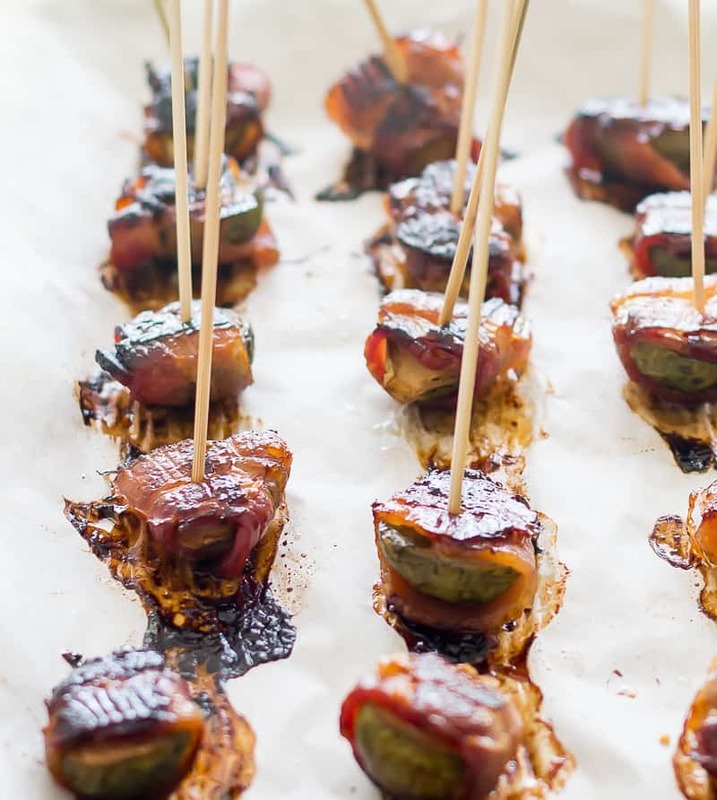 Bake the wrapped brussels sprouts for 35 minutes, or until the bacon has cooked through ( this can vary wildly based on the thickness of bacon you use. 25 min for very thin bacon or up to 45 min for extra thick cut, but 35 was just perfect for the center cut medium thickness bacon I used ). After allowing them to cool on the pan for about 10 minutes, turn each sprout over and stick through with a skewer to serve.